It’s hard to see a child who is sick, but Luke Beck (in photo above) of Holy Childhood in Mascoutah seems to be taking it in stride. 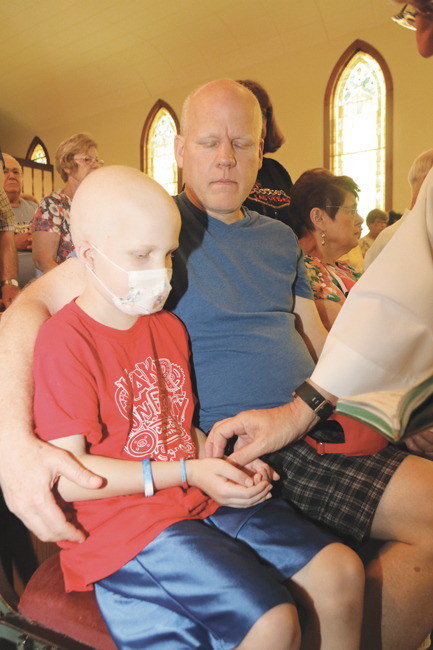 He and his dad, Dan, and his mom, Rhonda, attended the “Mass, Anointing and Devotions for People Living with Cancer. The Mass, celebrated regularly in the North Central Vicariate, was held July 18 at St. Teresa in Marydale. The church was what I’d call “comfortably full.” So many people who came for the anointing or to pray for family members and friends with cancer, an insidious disease that can rob us of those dear to our hearts. Many people at the Mass were touched by Luke who was diagnosed with leukemia in May, Rhonda said. The family looks ahead to three years of treatments with a positive attitude. Because they said their faith is strong and deep, they see this as part of their journey, even if it is one that brings tears to their eyes and weighs on their hearts. Others spoke to the family after church, especially since Rhonda’s maiden name is Norrenberns, a familiar Clinton County name. Belonging to Holy Childhood in Mascoutah, the family “heard” about the Mass and went. Our Lady Queen of Peace in Belleville also has a Mass with the prayers of St. Peregrine — patron saint of people suffering from cancer, AIDS and other serious illnesses. The liturgies give people a chance to pause and reflect and pray. It can be a time to see the blessings we have received and offer support for the tough times we are facing, or are about to face. The readings and Father George Mauck spoke of illness and the support God offers through Jesus Christ. Whether we welcome purification through sacrifice or rage against it as we come to terms with it remains, at the end, a personal choice not easily made but often carrying with it the opportunity to reflect on life, our relationships with family and with God, giving us a way to look once again to see what God wants us to do with what we have been given. Sometimes finding a way to be grateful for what we have is not always easy or even possible in the face of illness. We didn’t ask for illness; we don’t want it for ourselves or our family members. It is not what we have but how we choose to live with it that can make life more acceptable. Although he’s only 7, Luke gave me someone else for my prayer list. My heart goes out to the family as did the hearts of many others at church that night. May we remember Luke and all those struggling to meet the challenges posed by an illness that they know God is beside them, walking with them.